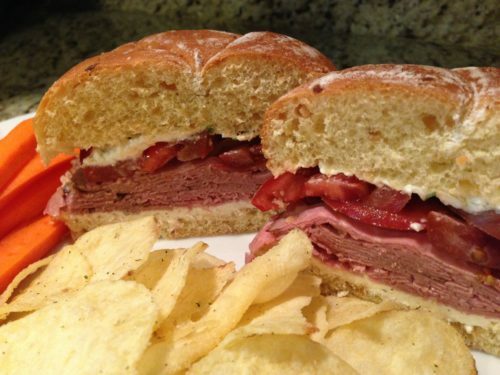 Roast Beef Herbed Cheese Sandwich. This is a favorite sandwich based on one that is sold at the Vie de France bakeries. When my husband and I were dating, the Vie de France restaurant in the Fair Oaks Mall was a favorite casual lunch spot. This sandwich was our favorite item to order at Vie de France other than the chocolate croissants. That restaurant location has since closed so I have recreated my version of the Roast Beef Herbed Cheese Sandwich at home. 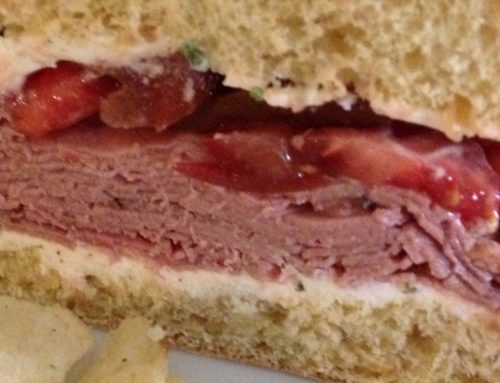 At Vie de France, we would always order our roast beef and herbed cheese sandwich on a croissant. After all, it’s a French bakery with very tasty croissants. For this recipe and photos, I used an onion sandwich roll called an Onion Bulkie. 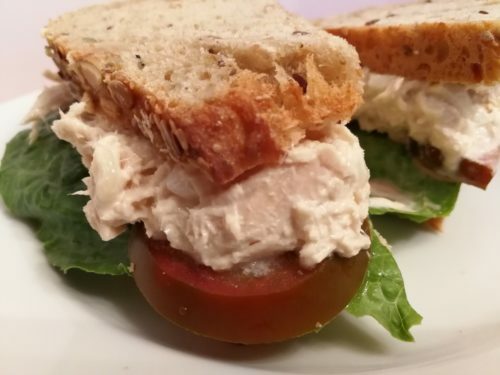 You can use your favorite sandwich roll, baguette, or even sliced bread. 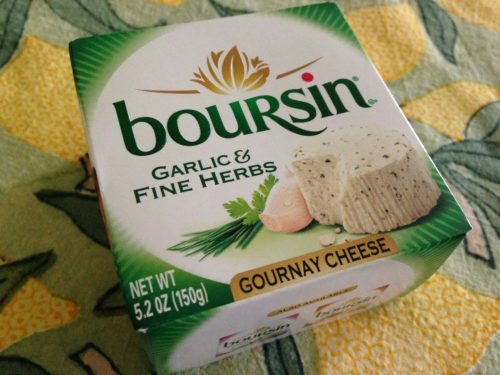 For my copycat recipe, soft herbed cheese called Boursin is spread on halved sandwich rolls. 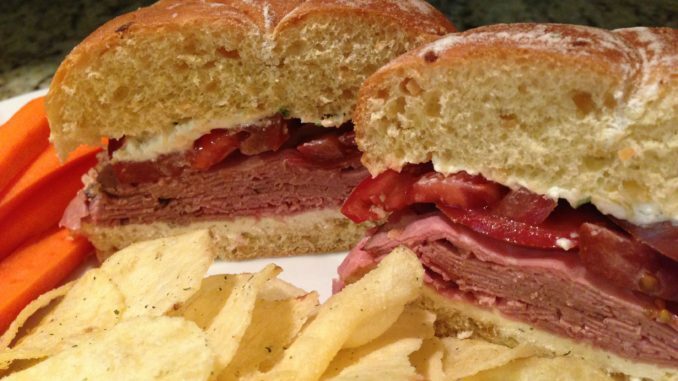 Then, thinly sliced roast beef is piled high and topped with ripe tomato slices. 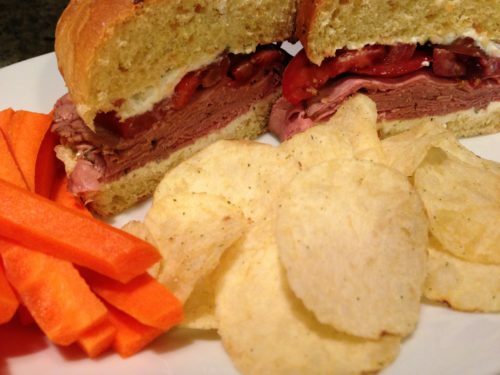 The sandwiches are cut in half and served with potato chips or carrot sticks. Serve with potato chips, carrot sticks, or a side salad. 1. Slice the sandwich rolls in half. 2. Spread the herbed cheese on the insides of the rolls. 3. Pile the roast beef on the herbed cheese. 4. Arrange the tomato slices on top of the roast beef. 5. Place the roll tops on the tomato slices. 6. Cut the sandwiches in half and serve! Makes 2 sandwiches. Offer with potato chips, carrot sticks or a side of my Colorful Chopped Salad. Variations: Use sliced turkey or ham in place of the roast beef. Add some lettuce or arugula for a nice crunch. 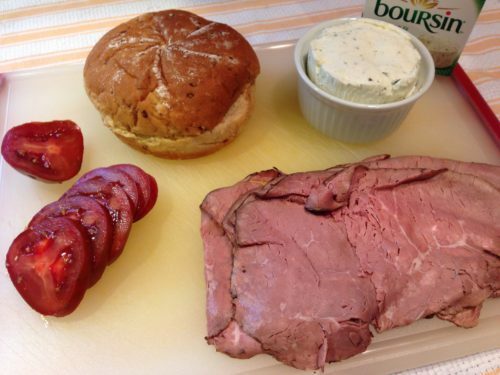 Try a spreadable herbed cream cheese instead of the Boursin. Add some micro greens, thinly sliced purple onion, or bell pepper strips.